I had finally reached my breaking point, I thought, as I wheeled myself out of the hospital. I wondered: How would I continue such a life at age 31? In addition to my feet and leg symptoms—severe, chronic pain and sensitivity to touch; vasospasms; skin temperature changes and discoloration; serious muscle atrophy; and leg tremors—I was also experiencing memory loss, confusion, and fatigue from all the medicine, which did little to help. 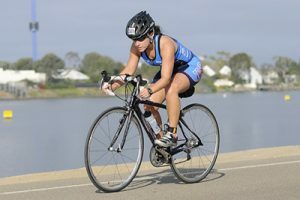 I couldn’t understand how I went from a passionate marathoner and an avid athlete to the constraints of a wheelchair. But I had to face my reality—I had complex regional pain syndrome (CRPS) a chronic neurological syndrome. Before December 2005, I was a marathon runner, mountain biker, adventure racer, soccer player, and hiker. I was also many other things: a daughter, a sister, a friend, a young professional with a promising career. But suddenly, my life changed forever after a marathon running injury (December 2005) in the ball of right foot, specifically the first metarasal joint at tibial sesamoids and flexor hallicus longus. I started having excruciating pain in that foot—and although I’ve always had a high tolerance for pain, this pain literally knocked me off my feet. Eventually, after a year of expert medical professionals, random diagnoses, medical procedures, prescription drugs, and living in a wheelchair, I was diagnosed with CRPS in both of my feet and legs. The symptoms had spread from my right foot to both feet, and then up into both legs. Although pursuing sports again seemed like a far-off dream, I still had the determination to walk and be off prescription medicine. I couldn’t be the person I used to be on all those drugs, and I would fight to regain my active life again. This was my path. Initially, I started seeing podiatrists and orthopedic surgeons because I’d determined the initial onset of pain was from a marathon injury. They gave multiple diagnoses, including sesamoiditis and metatarsalgia, and the standard treatments for my right foot: wearing off-loaded boots to take pressure off the forefoot, cortisone shots, removing the sesamoid bones, orthotics, anodyne (infrared) therapy, and physical therapy. To reduce the swelling, I followed one doctor’s order and did cryotherapy—placing my foot in a bucket of ice water for a few minutes, walking for a few minutes, and then repeating three times. Unfortunately, the pain got worse, possibly because I stimulated all my nerves in my right foot, which is contraindicated in CRPS. In May 2006, after five months of only wearing sneakers and no cardio activity whatsoever, the symptoms spread to both of my feet and legs and became more severe—continual and severe pain, throbbing, aching, pins-and-needles, occasional attacks of sharp pain, ice-cold temperatures, and discoloration (blue-purple-red). My feet were also extremely sensitive to pressure or touch; and it was painful to stand, walk, or have them in the down position. My feet only felt better when they were elevated and kept extremely warm, and I wore only slippers to walk a couple steps to-and-from the bathroom. I was humbled, not to mention scared and disheartened. I used to run marathons, but now I could barely take a step. But I had to stay off of my feet and did so from June 2006 to May 2007. Luckily, I had an amazing support system, including family, a boyfriend, and close friends to help me do medical research, transport me to/from doctors and procedures, buy food, cook, run errands, and clean; an accommodating employer that allowed me to work from home. This factor—of being so dependent—was difficult, for prior to this injury, I was extremely independent. Likewise, it was equally hard to explain the injury and the pain, especially due to the lack of diagnosis and treatment at this point. At the end of July 2006, I went to another orthopedic surgeon. After only touching my feet, he said that my symptoms were not an orthopedic problem and recommended instant blood work and vascular and nerve tests. Over the next six months, I was evaluated, tested, and treated by a rheumatologist, a vascular surgeon, a neurologist, and a hematologist at a prestigious medical hospital. I had numerous MRIs, a 3-phase bone scan, an EMG, and other vascular tests—including an arteriogram of my lower extremities in which a catheter was placed in my right pelvis and weaved through the artery to both legs and contrast material injected into the blood streams. The arteriogram revealed patent aortoiliac, femoral, and popliteal arteries. The tibial vessels were diffusely swollen all the way to the feet. However, I also had Deep Venous Thrombosis (duplex scan, direct Doppler, plethysmography) and Superficial Deep Venous Insufficiency (photoplethysmography, direct Doppler, duplex scanning) that came back normal. The initial tests only indicated soft tissue swelling. A CT angio of my chest and stomach was negative except for a cyst on my ovary. An EKG found a possibility of mitral valve prolapse, but further testing indicated no problem. The initial nerve tests came back negative, but later the sympathetic nerve blocks indicated possible CRPS. The vascular surgeon eventually recommended treatment by a rheumatologist, who diagnosed me with vasospasms and possible symptoms similar to that of Raynauds or CRPS. To open up my arteries and improve blood flow, he prescribed a daily dose of Norvasc (a calcium channel blocker) and a full Aspirin (to thin the blood); and recommended that I stay in my condo with the heat above 78 degrees. I had to wear multiple layers of socks and clothes, and even put heat warmers in my slippers until further testing was done. In the same timeframe, a hematologist checked for a possible autoimmune disorder. I had blood drawn over 20 times over the course of the year, with up to 14 vials at a time. All my blood work was normal except for my serum cryofibrinogen test—a rare and abnormal protein in the blood plasma—which was intermittently positive. Since this is a life threatening disorder, I spent weeks with the doctors determining whether or not I should be treated. In November 2006, the hematologist prescribed a heavy dose (60mg) of Prednisone in case there was an autoimmune or inflammation factor occurring in my body. There were weeks of waiting to get appointments, learning test results, and testing out drugs prescribed by all of these leading doctors. My patience was fleeting, and I was always scared of the possible outcomes. By November 2006, the symptoms were unbelievable, unmanageable, and incomprehensible, and things just kept getting worse. I continued to see the cadre of reputable physicians at the hospital, all of whom had plenty of hope for me receiving answers, mobility, and the ability to walk again. For the first time in my life, I requested pain medication and was referred to a pain specialist at the hospital’s pain clinic. The doctor at the pain clinic prescribed numerous drugs, including Lyrica, Calcitonin-salmon, and Clonidine (Catapres). From November 2006 to January 2007, I also received multiple sympathetic nerve blocks from the pain clinic, which were performed to determine if there was damage to the sympathetic nerve chain and if it was the source of pain. A local skin anesthetic was given in the lumbar area of my back and a needle inserted under fluoroscopy next to the vertebral body and an anesthetic medication injected. The chemical sympathectomy applied an anesthetic to the network of nerves extending the length of my spine, which controls the involuntary functions of the body. When numbed, it opened up the narrow blood vessels in my legs to improve blood flow. This is a CRPS diagnostic test primarily, but it also provided temporary relief—far in excess of the duration of the anesthetic. The doctors noticed redness of the lower extremity and an increased temperature during the post-op evaluation, indicating possible CRPS. They determined that my sympathetic nervous system took the pain pulses and continued to fire off neurons along my major nerves. It is suspected that my brain and spinal cord (central nervous system) control over these various processes was changed as a result of the initial running injury and also caused the vascular symptoms. Finally, I thought I was seeing a glimmer of light in this tunnel of hell. No matter what the diagnosis—neuropathy, CRPS, and symptoms similar to Raynauds—I didn’t want to be a pain patient (i.e., just treating pain), so I continued to search for medical answers. I researched everything about my symptoms, possible diagnoses, and treatment options. I also reached out to reputable doctors and hospitals, turned to the Internet and medical journals, tapped into my network, and connected with those who had experienced similar symptoms. I needed to listen to the doctors, but I continued to be my own medical advocate, so I could make informed health care decisions. In February 2007, I asked the pain specialist to wean me off all the nerve drugs I was prescribed in November 2006, and, instead, he prescribed a low dose of Nortriptyline—a tricyclic antidepressant marketed for depression, but at low doses, is used to treat chronic pain/neuropathy. In addition, the rheumatologist continued to prescribe Aspirin and Norvasc for the vasospasms. At the same time, a surgeon recommended I start physical therapy and a transcutaneous electrical nerve stimulation unit to desensitize the nerves in my legs and feet. This overrode the pain by interrupting the pain signals transmitted to the brain. I also had an intense home desensitizing therapy program, using all size and textures of balls and other items: sandpaper, marbles, golf balls, baseballs, etc. I also rebuilt my muscles in my legs and feet using weights a stationary bike without any resistance to increase circulation to alleviate the pain from the vasospasms. I was terrified of the color and temperature changes of my feet and the pain and thought I would make the symptoms worse. Everything was extremely painful at first, but I persisted. The temperature changes and my level of pain, its speed of onset, and the time until the symptoms were relieved, all improved. After six months of slow but steady improvement, I began to notice improvement in the temperature changes, and I began to walk in baby steps. I learned to recognize the pain signals and the temperature-discoloration changes, and to focus on other thoughts to get past the pain. I also controlled the symptoms with daily exercise, acupuncture, weekly massages, pilates, and yoga to improve circulation and relieve the pain. I found spending time focusing on my health and healing and not pushing myself—including sleeping and relaxing—was very beneficial. The doctors weaned me off all medicines—the Aspirin in August 2007, Nortriptyline in October 2007, and the Norvasc in March 2008 after the winter temperatures subsided. I have always preferred to handle pain by making healthy lifestyle choices and enjoying the natural endorphins and cortisol release when I exercise, rather than relying solely on conventional medicine. As a self-determined treatment in July 2006, I went on the Inflammation-Free Diet (which I continue today). This diet includes vegetables and fruits, lean meats, ginger, and nuts, with limited and almost no sugar, alcohol, caffeine, and sodium. I have found this diet is essential to maintain central nervous system health, expand blood vessels, and reduce inflammation in the body. I also take a daily multi-vitamin, Omega 3, calcium with vitamin D, B-complex and B-12 and recently relocated and live in a warmer climate. In the end, I couldn’t have done it without determination, persistence, and sheer willpower, all combined with good doctors and proper medicine, physical therapy, a healthy diet, alternative approaches, and a support system. In addition, I’ve always been a social person, and rather than isolate myself during this difficult two-year period, I stayed social, surrounding myself with positive, supportive people. I also help others with CRPS or other illnesses, which I’ve found offers a sense of fulfillment. I still have symptoms every day, especially in cold temperatures, and the symptoms in my feet and legs occasionally flare up and it scares me at times. As I see it, I had a choice: I could have woken-up each day for two plus years angry and focused on the pain; or I could accept everything that happened to me—the good, bad, ugly, and having CRPS—and focus on medical answers, healing, and positive energy. Through it all, I have always kept my optimism and am managing and living a healthy and happy life with CRPS, even venturing back into my enthusiasm for sports.